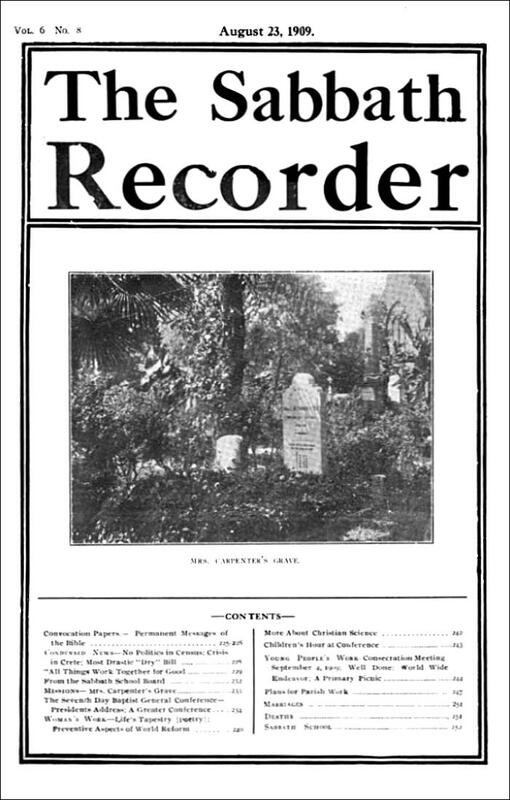 .... On June 13, 1844 the first Sabbath Recorder was printed and mailed from New York City. It remains as one of the oldest continuous religious publications in the country. The five-column weekly newspaper carried articles on religion, happenings among Seventh Day Baptist mission fields, and national news, including an article from the Baltimore American about Morse’s magnetic telegraph that had just been perfected. The writer was thrilled to be able to convey the news from the Democratic convention in Baltimore to Washington, as soon as it was announced.